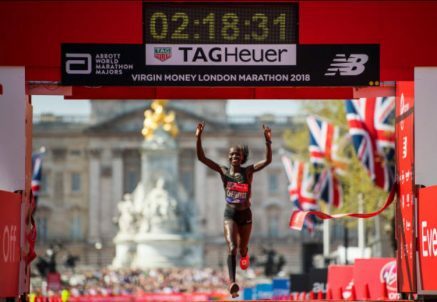 22nd April 2018 – As London basked in glorious sunshine and temperatures sawed to record highs on race day, Olympic Champions Vivian Cheruiyot (KEN) and Sir Mo Farah (GBR) showed they were up for the challenge with record breaking performances of their own. If the temperature in the air was hot, the pace at the front of the women’s field was even hotter as they set off in pursuit of the world record. However, Vivian chose to sit off this pace and run her own race. “I needed to run the best race for Vivian” she said after and this is what she did. Recording almost metronomic splits for each 5k Vivian chipped away at the leaders’ advantage until with 7k to run she moved to the front herself. From here the result was never in doubt and it was just about her time. Still Vivian kept in her rhythm and crossed the line in 2:18:31 to take over 5 minutes off her previous best and move to number four on the all-time marathon list. Having now officially retired from the track this was arguably Mo’s first serious foray into marathon running and he certainly showed that he can make the step up. Unlike Vivian he chose to mix it at the front of the men’s race which also set off a record breaking pace and passed the halfway mark in 61:03. The second half proved tough for everybody, but Mo stuck to his task well and as he rounded onto The Mall in third position he could see that the British record was still within his grasp. Clearly tired he pushed as hard as he could and clocked 2:06:21 to take 52 seconds off of Steve Jones’ record which had stood for over 30 years. On the track there were strong performances from a quartet of PACE athletes. At the Grenada Invitational Bralon Taplin (GRN) and Shamier Little (USA) completed the 400m double clocking 45.29 seconds and 51.45 seconds respectively. Fred Kerley (USA) and Jenna Prandini (USA) ran at the Mt Sac Relays with Fred winning the 200m in 20.48 seconds and Jenna making a welcome return to competitive action in the 100m and placing third in 11.09 seconds.